This week we’re thinking about all things green in honor of St. Patrick’s Day! And while it isn’t easy being green when you’re talking about wedding cakes, it is quite pretty. Also, you can’t get more “spring-y” than green. That’s one of the things we love most about spring – everything is turning green! And that makes all the difference – this is a modern and fun wedding cake! 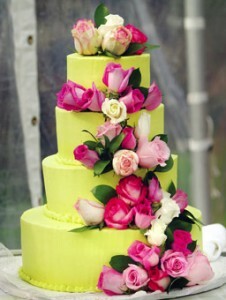 The cascade of brightly colored roses just adds to the beauty of the cake. There’s something about lime green and pink together that we just love! It would be the perfect centerpiece at your spring wedding. You can find this lovely wedding cake here.